This is great. Prior to cheap SDR, I was using hamlib to control a CIV/CAT remotely tunable radio. I have been wondering/hoping hamlib support to control a RTL dongle could be extended. 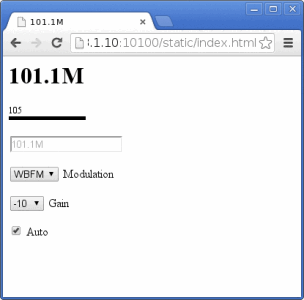 Also check my fork for demodulated audio streaming and in page audio player with html5. Great, just what I was looking for!! This will be handy to use the dongle as a remote tuner on a raspberry.